My client is remodeling and has original fixtures in the house. Should I reuse them? Absolutely! Obviously we are a little biased, but there are so many benefits. By restoring original fixtures you are honoring the architecture of the house, and also creating unique detail that you don’t get with mass-produced new pieces. There are some things to keep in mind to make the process smoother. Be organized about locations and labeling. Supervise the removal of delicate lighting before demolition. Communicate with the electrician about changes to the electrical system, i.e. Are they upgrading from knob and tube to modern electrical boxes? The Gilt Lily Chandelier is still available on Appleton Antique Lighting's website. What is UL and what does it mean for my projects? UL is short for Underwriter’s Laboratory, and is the nationally recognized electrical safety standard. More and more electrical inspectors in the Greater Boston Area require that all lighting is UL labeled. You can check for a UL label by looking at the canopy of a hanging fixture or backplate of a sconce. UL certified workshops such as ourselves can UL label existing fixtures by rewiring using all UL parts, and by meeting stringent standards in the wiring and testing, and inspection of fixtures. My client has a sentimental light that is much more old fashioned than the rest of the house. What are some ways to update the look? There are so many options. With table lamps, changing the base and lampshade can transform a piece. 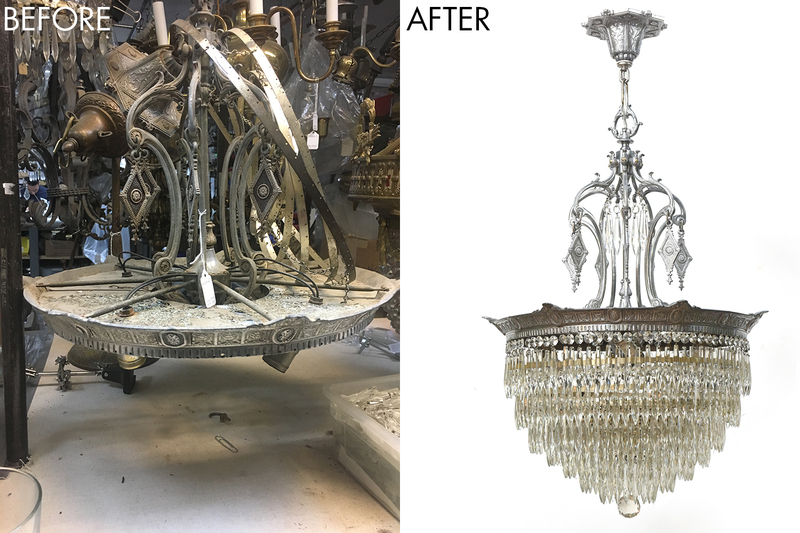 With chandeliers, adding/removing crystals, changing lampshades or candle covers, and changing finishes can make a piece adapt. Sometimes we find that an element can be used in an entirely different way, such as a lampshade that we turned into a flush mount fixture. There are an infinite number of ways that we can work with you to customize lighting. 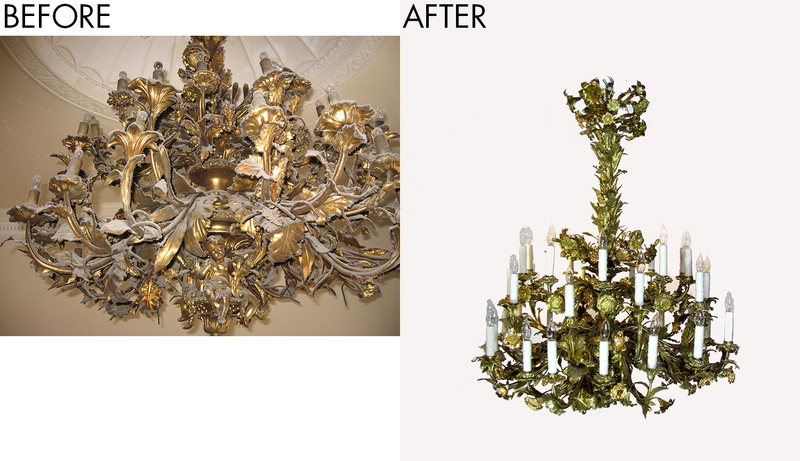 The Petite French Bronze and Crysal Chandelier is still available on Appleton Antique Lighting's website. We purchased this in Europe. Can we use it in the US? Sometimes pieces wired in Europe will work when plugged in, however, much more heat is generated than they are designed to handle, and they will eventually fail. The gauge of wire, the setup for installation, and the sockets themselves are all different. Unless they have already been UL labeled, in our experience it is a good idea to rewire European pieces for safe and dependable use in the United States. I purchased this lamp online. Is it safe to use? It depends. We’ve seen it all! There are some obvious signs of dangerous wiring to look for even when the light works. The wire itself should be free of any fraying and cracking, plastic wire should still be supple, and there should be no exposed copper wire anywhere except for the ground. The plug should be polarized; meaning one prong is wider than the other. If you look in the socket (with the light unplugged), you can feel the paper insulator to make sure that it is not crumbling or burnt. If you spot any of these signs, it should be rewired. If you are unsure, bring it in and we can inspect it. From a sustainability standpoint, not only are you recycling, but you are preventing a large amount of resources from being used in the production of new lighting. Also, the money spent on restoration supports local craftspeople and small businesses. From a budget perspective, while you could find new lighting that is less expensive, you cannot find the beauty, variety, and quality of detail and materials with new lighting. And from a design perspective, antique lighting is like distinctive jewelry that can capture the imagination, humanize space, and express the personality of a home and its occupants. 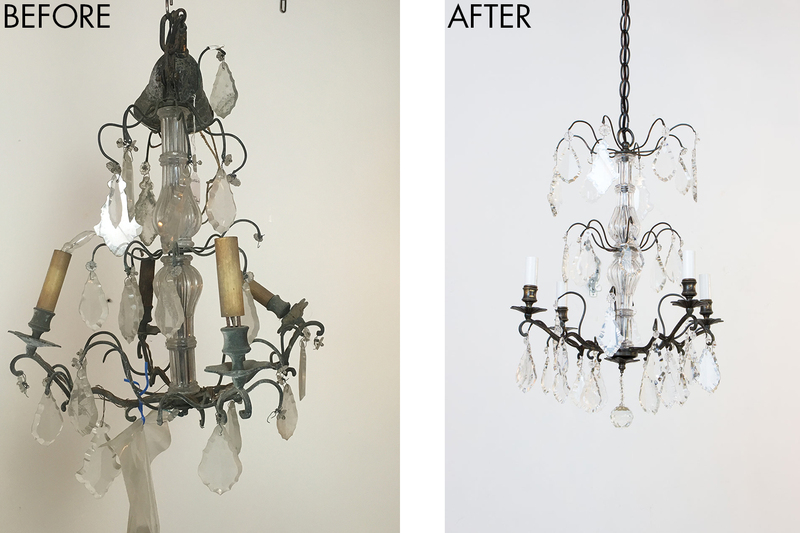 The Tiered Crystal Four Light Fixture is still available on Appleton Antique Lighting's website. 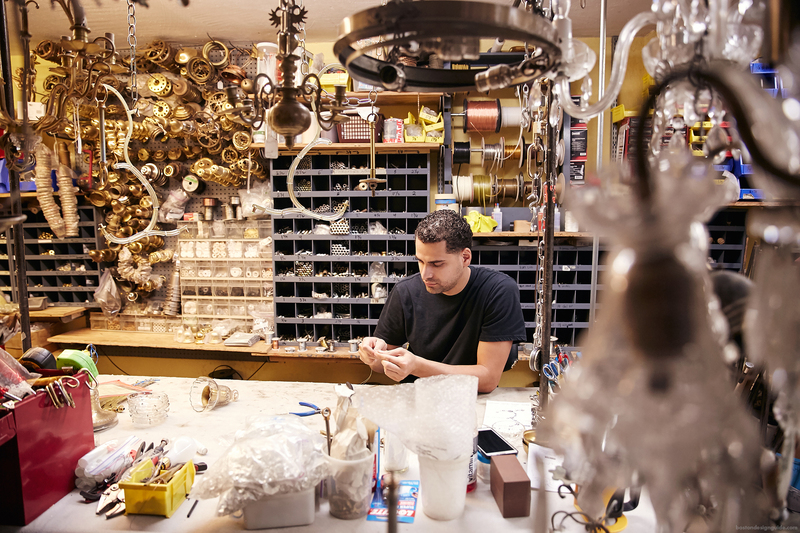 Learn more about Appleton Antique Lighting in Chestnut Hill, MA.